Andrew I. Kay, Robert B. Noland, and Caroline J. Rodier, 56 pages. March 2014. 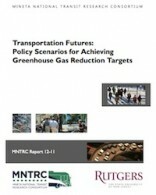 The research presented here analyzes three scenarios to reduce GHG emissions in the transportation sector: changes in the perceived price of travel, land-use intensification, and increases in transit. Elasticity estimates are derived using an activity-based travel model for the state of California and broadly representative of the U.S. The VISION model is used to forecast changes in technology and fuel options that are currently forecast to occur in the U.S., providing a life cycle GHG forecast for the road transportation sector. Results suggest that aggressive policy action is needed, especially pricing policies, but also more on the technology side.